I was thinking of a serious look at 9/11 but I really didn’t feel like it. So for now something unrelated to this auspicious date, and somewhat more entertaining. 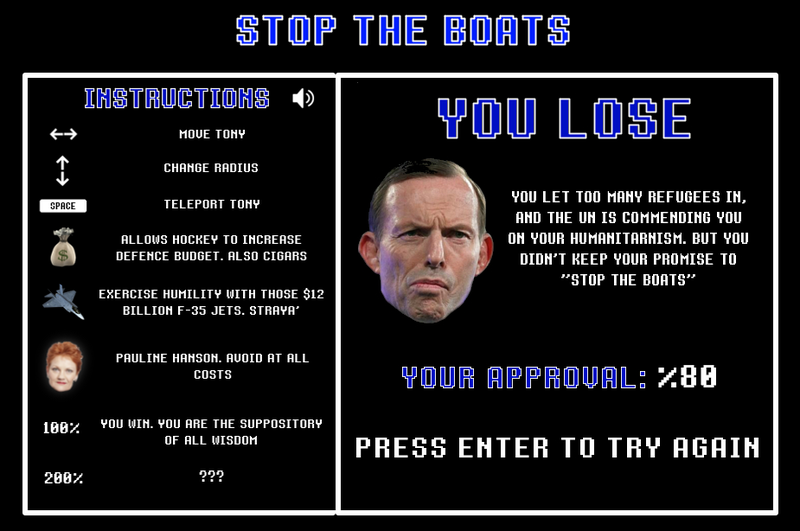 Abbott stop the boats simulator. Oh the LOLS. Something a little lighthearted on a day when we might be a bit glum. Posted on September 11, 2014, in Asylum and refugees, Fascism, Food Security, Land, Mock and Awe, Nationalism, Politics, Transport and tagged Boats, Joe Hockey, Tony Abbott. Bookmark the permalink. Leave a comment.